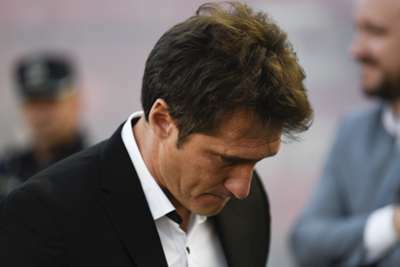 Boca Juniors head coach Guillermo Barros Schelotto expressed his sadness after his side suffered a 5-3 aggregate defeat to bitter rivals River Plate in the Copa Libertadores final. Sunday's controversial rearranged second leg at the Santiago Bernabeu in Madrid went in favour of River, who secured a 3-1 extra-time victory against 10-man Boca. After the eagerly anticipated match was twice suspended in November due to an attack on Boca's team bus, River came out on top thanks to extra-time goals from Juan Quintero and Gonzalo Martinez. Boca had taken the lead in stunning fashion via Dario Benedetto on the stroke of half-time before Lucas Pratto equalised for River, who went on to secure a fourth Libertadores trophy. Fronting the media afterwards in the Spanish capital, Boca boss Schelotto could not hide his disappointment, telling reporters: "The only thing I feel is sadness for not winning the cup and giving it to the people of Boca. "That's the only thing that makes me feel bad – not bringing the cup to Boca." "I want to congratulate the Boca players for how they played, even when we were one or two less in the final, they pushed, fought and fought," Schelotto added. "Then, [I want to] congratulate River, who are the champion and won the cup." Boca had an appeal to be awarded the Libertadores title rejected by the Court of Arbitration for Sport (CAS) on Saturday. After CONMEBOL dismissed Boca's appeal, the Argentine giants took their case to CAS but they were unsuccessful as the match took place at the home of Real Madrid. "Sometimes it seems that we are incorrigible," Schelotto said. "There's very little we can learn from the people here and from this stadium. I hope we learn a lot, but sometimes we seem incorrigible. It seems that if this final repeats itself in a few years, it won't be able be played [in Argentina]. "In our country, during these days, they said that it was normal for you to be thrown a stone when the visiting bus arrives. No, it's not normal ... it's abnormal to throw a stone at a bus. "It's like entering a shop and throwing a stone at someone. Hopefully these things change, but in the sporting aspect it's done, River won."